What Makes the iPhone 6 and iPhone 6 Plus Different? It's easy to see how the iPhone 6 and iPhone 6 Plus are different physically: The 6 Plus has a larger screen and is bigger overall. Beyond that obvious difference, though, the ways the two models differ are more subtle. Understanding these differences is important if you're planning to buy one. This article helps you understand the five key ways in which the iPhone 6 and 6 Plus are different to help you make an informed iPhone buying decision. The iPhone 6 series no longer offers the latest models and has been discontinued by Apple in favor of newer models. Read up on the iPhone XS, XS Max, and XR to learn about the newest options before you buy a new phone. The most obvious difference between the iPhone 6 and 6 Plus is the size of their screens. The iPhone 6 sports a 4.7-inch screen, which is a nice improvement over the 4-inch screen on the iPhone 5S and 5C. The 6 Plus upgrades the display even more. The 6 Plus has a 5.5-inch screen, making it a "phablet" (a combination phone and tablet) and a close competitor to the now-discontinued iPad mini. Not surprisingly, the 6 Plus has a different resolution too: 1920 x 1080 pixels versus 1334 x 750 pixels on the iPhone 6. Users who are looking for a combination of screen size and portability with a good feel in the hand will prefer the iPhone 6, while those seeking the largest possible display will enjoy the 6 Plus. Because of its larger screen, the iPhone 6 Plus is hard on its battery. To compensate, its larger battery offers much more capacity and a longer battery life than the battery in the iPhone 6, based on information supplied by Apple. If having the longest-lasting battery matters to you, check out the 6 Plus. Because of its larger screen and improved battery, the iPhone 6 Plus carries a price premium over its sibling. Both models offer the same storage options — 16 GB, 64 GB, and 128 GB — but you should expect to spend about $100 more for the iPhone 6 Plus than the iPhone 6. While that's not a tremendous difference in price, it will matter if you're very budget conscious when making your buying decision. Because of the difference in the size of the screen, battery, and some internal components, weight is a key difference between the iPhone 6 and 6 Plus. The iPhone 6 weighs in at 4.55 ounces, just 0.6 ounces more than its predecessor, the iPhone 5S. On the other hand, the 6 Plus tips the scales at 6.07 ounces. The physical dimensions of the phones are different, too. 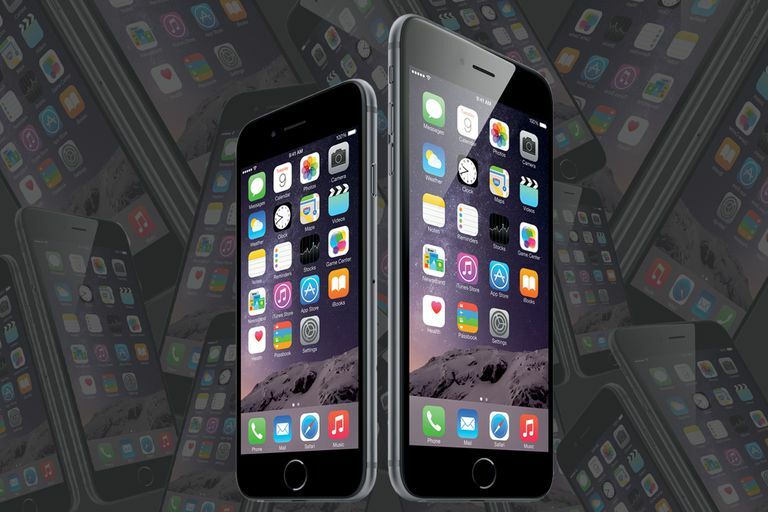 The iPhone 6 is 5.44 inches tall by 2.64 inches wide by 0.27 inches thick. The 6 Plus is 6.22 by 3.06 by 0.28 inches. The differences are not huge, but if keeping your pockets or purse as light as possible is important to you, pay attention to these specifications. Just looking at the specs, the cameras on the iPhone 6 and 6 Plus appear to be identical. The back camera on both devices takes 8-megapixel images and 1080p HD video. Both offer the same slo-mo features. The user-facing cameras capture video at 720p HD and photos at 1.2 megapixels. However, there's an important element of the cameras that makes a big difference in the quality of their photos: image stabilization. Image stabilization reduces motion in the camera — the movement of your hand as you take the photo, for example. It improves focus and delivers higher-quality images. There are two ways image stabilization can be achieved: hardware and software. In software image stabilization, a program automatically tweaks photos to improve their look. Both phones have this. Hardware image stabilization, which uses the phone's gyroscope and M8 motion co-processor to cancel out movement, is even better. The iPhone 6 Plus has hardware stabilization, but the regular iPhone 6 doesn't. So, if taking the best possible photos is important to you, choose the 6 Plus.